NETWORK FINALS: ABC had some local preemptions that pulled GREY’S ANATOMY and SCANDAL each down 0.1. Elsewhere, THE BIG BANG THEORY gained 0.1 in final numbers, but MOM, POWERLESS and the SUPERSTORE rerun lost the same. CABLE HIGHLIGHTS: TNT’s NBA doubleheader topped a fairly slow night for cable, with Cleveland vs. Chicago at 0.74, and Houston vs. Portland at 0.56. 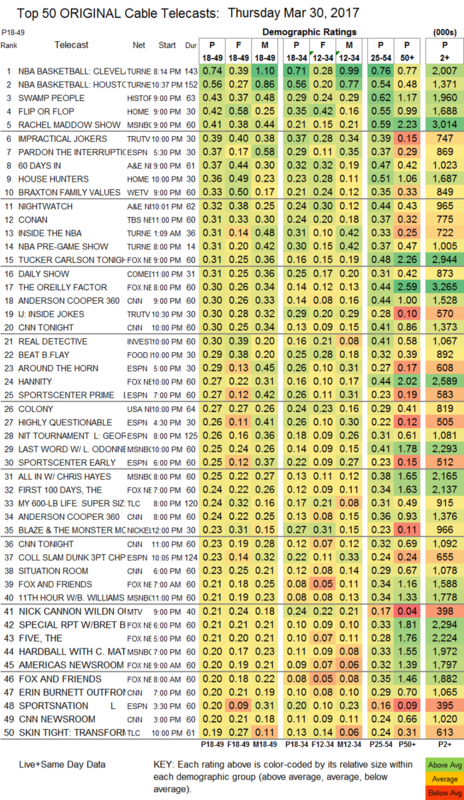 The highest-rated non-sports telecast was History’s SWAMP PEOPLE, down a tick to 0.43. On HGTV, FLIP OR FLOP lost 0.04 to 0.42, and HOUSE HUNTERS dropped a tick to 0.36. MSNBC’s THE RACHEL MADDOW SHOW continued its Trump-era surge, landing in the Top 5 with 0.41, a full tenth ahead of Fox News’s top show TUCKER CARLSON TONIGHT at 0.31 (and perhaps even more impressively the victor in total viewers, 3M vs. 2.9M). Tru’s IMPRACTICAL JOKERS slipped 0.03 to 0.39, and INSIDE JOKES was at 0.30. On A&E, 60 DAYS IN fell 0.02 to 0.37, and NIGHTWATCH was down 0.05 to 0.32. We’s BRAXTON FAMILY VALUES was steady at 0.33, and HUSTLE & SOUL was down 0.02 to 0.19. Food Network’s BEAT BOBBY FLAY ticked up to 0.29. USA’s COLONY rose 0.03 to 0.27. On TLC, MY 600-LB LIFE lost 0.03 to 0.24, and SKIN TIGHT was down 0.04 to 0.19. MTV’s WILD N OUT held at 0.21. The series finale of Comedy Central’s REVIEW remained at 0.14. CMT’s SUN RECORDS fell 0.05 to 0.09. 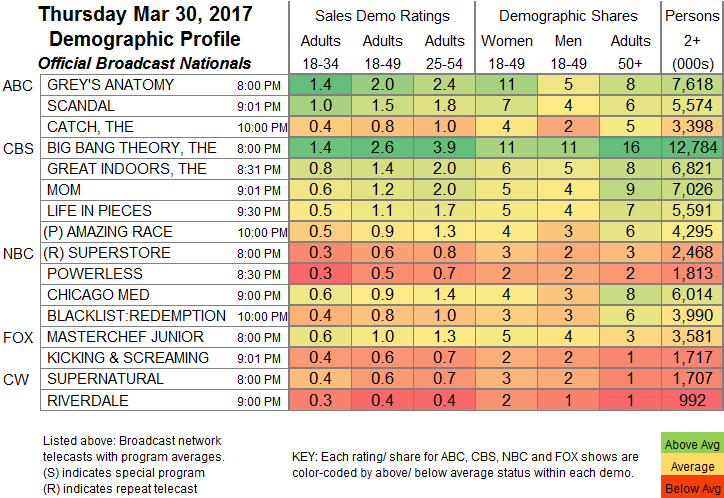 POP’s IMPACT WRESTLING stayed at 0.07.